This past weekend I ran my TENTH half marathon. I myself can not believe that I have ran that many halfs, let alone one. I never in my life dreamed I would be a runner but I'm so thankful for this sport God gave me. It's been a big blessing in life. This was my fourth time running Rock the Parkway and you can see last year's recap here if you want to. I want to give a bit of a recap about my training and then about the race itself. My training started January 25th and was eleven weeks long. The training was hard, very intense, but also doable. I decided to work hard at each run, to push myself at crossfit, but to also listen to my body, and if I needed to take it easy a bit to do so, as injuries are no joke. I averaged two to four runs a week with two to three crossfit sessions a week too. I often just tried to knock them out both in the same day and that seemed to work really well for me. This winter was also really cold so the treadmill was my really good friend. I think it paid off in the end because for some reason I like to get on those thing and push myself very hard. I think it makes it easy because you can just push a button to make the belt go fast and your legs have to just run it. I did a lot of runs where I would warm up and then just continually increase until the end of the run where I would give an all out sprint. I think that helped me get some time off of my miles. At crossfit for these past eleven weeks I competed in the Crossfit Open which is basically a worldwide competition and those who do really well advance to regionals and then the crossfit games. I'm no where near advancing but the point was to test your limits and to push yourself. Some of the workouts they had us do were things I didn't know I could do (hello pullups!). However, when you have no option but to do something or else not get points in a competition it is amazing how your body and mind cooperate. It was eye opening for me and definitely help me to realize I can do things I didn't know I am capable of. 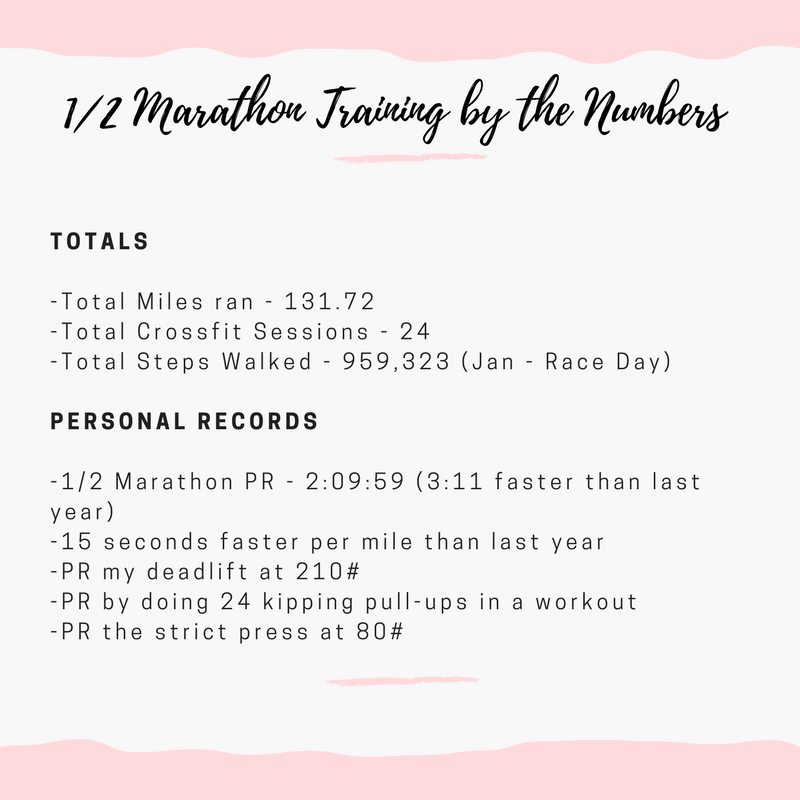 I also used crossfit into training because when I really didn't want to do something I would imaging the finish line of my half marathon and imagine beating my personal record and it would help me endure and push. The last week of training I did two really easy crossfit sessions and didn't run one single mile for a training run. Sometimes you just need to listen to your body. Also, this year I changed some of my eating habits and I think I feel so much better because of it. I've eaten more fruits and veggies, healthy smoothies and have eaten smaller portions. Now, you all know I'm on Team Beef so you know I'm still eating but I think my relationship with food has been better and I'm so thankful. Oh my word! Friday evening it dawned on me that I mentally was a week past my race but I hadn't yet ran it. That's not where you want your brain to be the night before a race. I didn't know what to do so I just told myself I'd give it what I could the next day and let what happens happen. Friday night I had steak, potatoes and broccoli because you all know what happened last time I ate pasta before a half marathon.....(insert eye roll). Saturday morning was chilly (40'ish degrees) but I had layers and knew I'd be okay. At the starting line I started to get nervous, which is a good sign for me. I had ran this course three other times so I knew what to expect. I knew where the hills were, I knew mile 1-5 were straight out, that miles 5-8 were through a neighborhoods with a ridiculous hill around mile 7/8 and that miles 8-13 were straight back. We started out and I decided to pace a little slower than last year because last year I took off and come mile 10 I was out of energy. Miles one through three just were really horrid. My legs felt heavy, I didn't feel like running and I thought I should just quit and get a "Did Not Finish." That's a great way to start out, right? However, I told myself that I'd warm up and start feeling better and I did! After mile three I felt really good. I ran miles three to seven just fine and then that big blasted hill came. I prayed really hard and asked God to just help me through it and I really know He did. I walked a little bit of it but it was so much better than last year. Around that big hill I saw another guy wearing a Team Beef jersey and we started chatting. I literally told him this was my tenth half marathon and that I was hanging up my jersey after this race, and I truly meant it at that moment, but not so much now. Anyways, my new Team Beef friend's name is Scott and he was a hero and ran with my from miles 8ish until mile 11ish. At mile nine I hit a wall and just wanted to be done. At mile ten I think Scott saw it in my face and he looked at me and said "Don't let it get to your head" and he was so right! I just kept pushing. There are two really big hills on miles eleven and twelve and I am pretty sure I walked a bit of those but Scott really encouraged me to just walk for 30 seconds and then to to pick it back up. At mile 10ish I looked at my time and knew if I kept running I could get a PR. I told myself I could do anything for a few more miles. This is Scott. Also, how do people look so nice post races? I look like death. At mile 11 Scott said bye and he took off. As I saw him run away I was just so glad he helped me push for those few hard miles. I looked at my watch and knew it was time to keep pushing but I also knew I had a PR! I ran that last mile fast and when I saw the finish line I sprinted and finished that beast. I cried when I crossed that line. All that training paid off and I was so so so thankful and glad. Here are a few numbers for all of you who like numbers. I think they are fascinating. It's funny because before the race and during the race I told myself this was my time to get a PR because this was my last half marathon. Oh us runners, always saying crazy things. But here are my thoughts ... if I ran a 2:09:59 in hilly Kansas City what can I do in a flat course in Wichita? Can I break 2 hours? I think I can! It will take more heart, sweat and training but I think I can do it. My short term goals are to PR my 5k in May and to bust my rear at Crossfit and to continue to improve there. I don't just want a 10 second PR either. I want to shave minutes off that race and I have about six weeks to do it. Lastly, last year I told you that a runner collapsed at the finish line and passed away. I thought about him a lot this year and prayed for his friends and family a lot too. At the start of our half this year they did a really nice tribue to him. A lot of his family and friends ran this race and I was proud of them for doing that because I know it was not easy. His family and friends also started a run in his honor and the benefits go to various charities. It is in Kansas City on May 19th. If you want more info on it you can check out their FB page right here. Great job! So awesome of Scott to help you out! Kudos for not quitting! Congratulations!!! 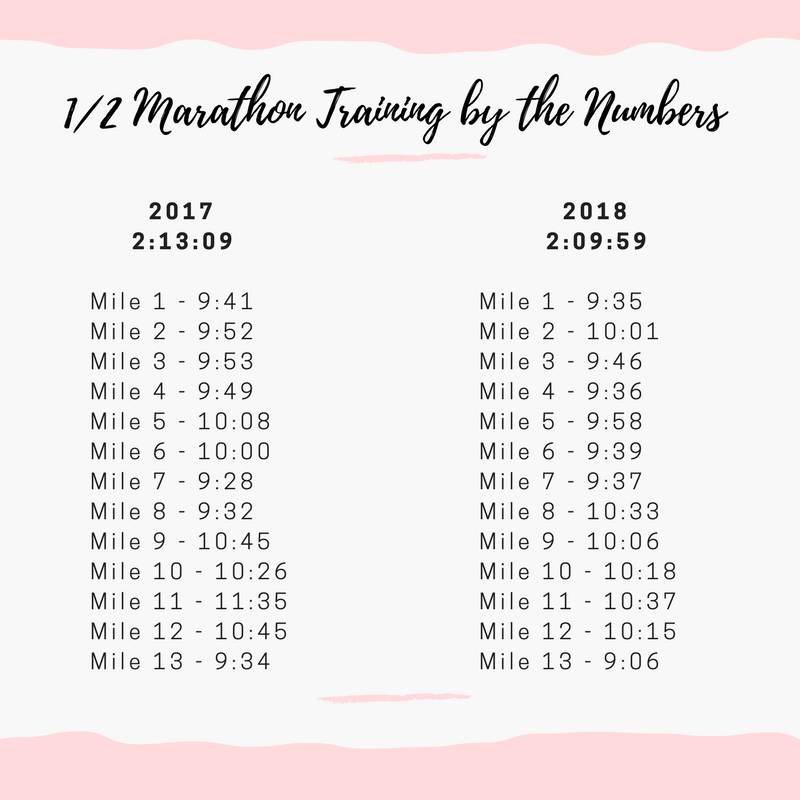 I've been mildly training to run my first-ever half marathon this year, so I loved this. I've started really slowly because I was basically sedentary for 3 or 4 years while having babies, the weather in Ohio has been awful, and my knee started bothering me after my second week. Like you, I'm trying to listen to my body. I have no interest in finishing in a set amount of time, I just want to know that I can do it. So, I'm just doing what feels right when it feels right, and so far, so good!! Ten?! That is AMAZING!!! You should be so proud of yourself!